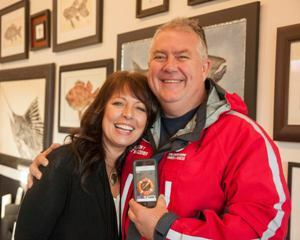 BC: A Ladysmith artist who survived five hours in the frigid waters of the Salish Sea in late October and the rescuers who gave her a second chance at life were both struck with emotion as they met again in Ladysmith on Sunday. “They were absolutely amazing and so compassionate and it was just such a beautiful meeting – I totally remembered the faces of the two guys that pulled me out of the water, ” said Mya DeRyan. Following DeRyan’s decision to go public last week with her story, many on social media expressed frustration with her putting rescuers own lives on the line. DeRyan said she understands their point-of-view and that it was never part of her plan to bring attention upon herself. “I felt so guilty about tying up both ferries and delaying everybody and just imagining what they must being going through emotionally, or judgmentally, ” she said. Now, she plans to close up her gallery in Ladysmith within the next week and move to Vancouver to be closer to her son to start a new chapter.